Welcome to Carmel Cottage This home is located less than a block from the beach and town. Comfortable up to date furniture. Plenty of seating for up to 6 Another view of the living room. Couch in living room folds out to be a bed if needed for extra sleeping room. Gas fireplace to cozy up to. Gas Fireplace, no wood to worry about. Puzzles and games to keep the kids enteratained. Flat screen with DVDs to watch. TV has been upgraded to a larger screen. Dinging room table will seat up to 6 once extended. Extra chairs provided. Fully stocked kitchen with all the essentials to cook meals. Plenty of dishes and counter space. Large fridge in the kitchen and washer and dryer for guests use. Hall view of kitchen Bathroom near the queen and twin bedrooms. Bathroom with shower and tub. Very comfortable twin beds down the hall from the living room. Twin room has a dresser for you to unpack in. Spacious Queen bedroom next to the twin room. Queen bedroom has a dresser as well. Enjoy the outdoor furniture and roast marshmallows with the family Just outside the back door is a gas grill and back yard. Beautiful sunset shot of Carmel Cottage. Sunsets just a block away Ariel shot of Carmel Cottage Thanks for visiting Carmel Cottage Manzanita Beach is just a block away. 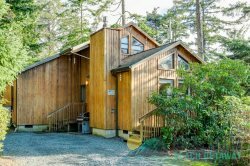 Carmel Cottage is located just steps to downtown Manzanita and a block up from Manzanita Beach. The one-level home is perfect for a single family or two couples looking to get away. Enjoy the cozy living room with warm gas fireplace and comfortable seating. Living room couch does fold out for additional sleeping if needed. The living room opens into the spacious kitchen and dining area. The dining table seats six. There is a fully stocked kitchen with everything you need to make the perfect meal. Down the hall from the kitchen is the one full bathroom with tub and shower. Beyond this, you will find the two bedrooms. One bedroom has a queen bed and the other has two twin beds. Washer and dryer included. Carmel Cottage sits on an oversized lot with plenty of room for the kids and dog to run. Carmel Cottage allows one dog per reservation with flea treatment before arrival. Come experience Carmel Cottage for yourself and see why it is a affordable favorite getaway for many. We look forward to seeing you at the beach! 1 dog allowed, must be at least 2 years of age, and flea treated. We will be back again and again: Just awesome every time we book a rental with your company! Always great responses from people on your staff. Its so clean and fresh! Its a darling little rental! we loved it. Sometimes beach houses smell funky or are kind of dark and dingy...but it was fresh and bright and seemed newly renovated. bright, cheerful, clean, we loved the dog basket, close to the main drag and the beach. A wonderful gem that I've probably driven or walked by several times. So glad I found it and it was a perfect place for our girls weekend. The outdoor space! We had a sunny day and sat out most of the day - talked to a lot of people walking into town. See above regarding fire pit. We will return and try to stay at the same house again. This home is located by everything! One block to the main drag (Laneda), one block to the beach, about a half mile from golf, etc. The house is well-appointed- crock pot, toaster oven, full stove, microwave, basically any appliance you'd ever need (including coffee grinder which worked out for us as all we brought was whole bean coffee). During this stay it was just two adults but easily this house can work for a family. We also had a small dog and there is convenient grassy areas for the dog. Felt warm and cozy. We really like Manzanita and staying so close to the action, in a house as opposed to motel, was very enjoyable. This visit we tried A Mighty Thai (across from the larger grocery) and while the service was so-so the food was terrific. Also stopped at Manzanita Winery (they let us bring in our small pup during a nasty downpour) and the service was great, wine delicious and soup spectacular! Danielle and her team are such a delight to work with. They are responsive, accommodating extremely efficient and after one very bad experience elsewhere we wouldnt dare rent from anyone ever again. We fell in love with manzanita 4 years ago but the ease, qualify and care that we feel when working with MNG definitely sealed the deal. Carmel was perfect to get our small children to and from the beach and laneda. So grateful for the washer and dryer, comfy beds and always well stocked kitchen. It was cute, and simple which is what you need with little ones who want to get into everything. I would highly recommend for a small family with Littles. The location is absolutely ideal, we wish it was for sale!!!! All experiences with your team went smooth. That it had all the amenities that we needed in the kitchen and that all of the cooking utensils were clean. You maintain your property in a very nice condition. Such a charming cottage! It's a great little getaway spot in the perfect location. Super easy walk to the beach and restaurants. The space is ideal for a couple or a family of 3 or 4 looking for a spot to getaway from city-life, which was perfect for us. This home had everything we needed for a comfortable stay. Super quick walk to downtown and the beach. Would certainly stay here again. Everyone I worked with was very helpful and friendly both when I made the initial reservation and later on when I had some questions. I even got a call back after-hours one evening, when it really could have waited until the next day! We really enjoyed our experience, both with the Carmel Cottage itself, as well as the interactions with your staff. I have only two suggestions: 1) Get the fireplace fixed! Not having a working fireplace was really the only negative thing at all about our stay. 2) I would also suggest instructions be left about how to operate the outdoor grill. I couldn't get it to work, but suspect it was just operator error. That said, we will definitely use your company again the next time we opt to stay in Manzanita. The website is easy to use and the team follows up well. Carmel Cottage is perfect for our family of four plus our dog. Easy walk to the beach and town. I really liked the courtesy and resonsiveness of this team. Lovely, well-appointed, spotless and comfortable house, great property managers, quiet and super convenient setting, great back yard. Reliable high-speed wi-fi, comfy bed and bedding, pretty with lots of light and big picture windows. I can't wait to get back here!!!! The members were friendly, prompt and helpful. Our stay was comfortable and relaxing. We're planning to make it a regular visit. Walking distance to the beach and the village amenities. You guys rocks!!! Anytime we called, you responded within minutes! Great place & nice beds. Would definitely use you guys again! Thanks! !